Do you have to remind your clients to keep their systems on for maintenance and patching to run each week? Yes me too, I almost have to remind them every week before they go home. Do you know how many hours on the phone that would be if I had to call each of my users to whisper “Hey, Don’t forget to leave your computers on!” I would have to say way too many to count, so I made the Announce Maintenance Plugin to do that for me. 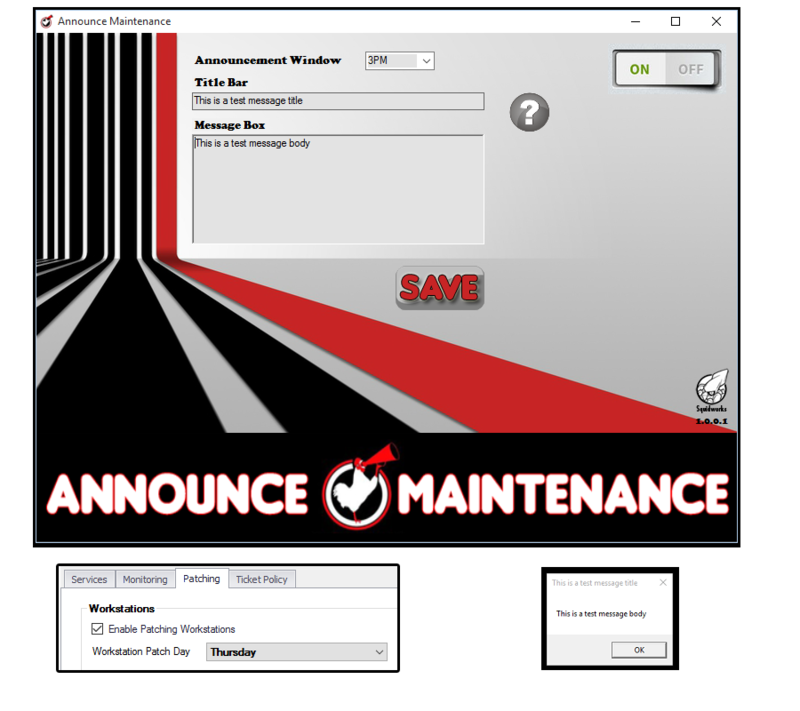 In you LabTech Console’s main menu select [Tools] menu and slide down to [Announce Maintenance] sub menu. That will launch the configuration manager to allow you to create the message, set the time of day you want it to launch (Window) and the Title of the Message Box. You can then turn it on or off for all clients by selecting the On /Off switch. The announcement will only run once in or around the Window time (+/- 6 minutes) the “Eve” before the “Workstation Patch Day” and only for Locations that are set to “Enable Patching Workstations”. If you have your patch day set to Thursday and your Window set to 3PM then on Wednesday Afternoon at 3 PM the announcement will go out to all “online” workstations at that location. Great idea for a plugin. Well done. May I ask can it be configured to notify them on the day of patching e.g. say we patch at 11pm on a Monday night and we want to notify them that evening before they leave work say at 4pm – would this be possible with this plugin? Version 1.0.0.1 is expecting and after 12:00 AM run for Patching. I know this is not everyone as you just mentioned so we will put that in for next release. A bit more customized running time. Nice ! I cant wait to test it out ! I’ve not seen that yet so I will need to go dig around to see. It may be tied to UAC? googling should help. I have begun seeing the same kind of error that Ben referenced in his comment on many machines and have had to disable the plugin for now until a fix can be found. It is popping up a window on the computers indicating that the Windows Script Host errored in Line 1 Char: 151 error: unterminated string constant Code: 800A0409 / Source: Microsoft VBScript compilation error. Any ideas? I found an article stating that error code has to do with a syntax issue in the script. Is is possible that there are certain characters in the message to be displayed that could cause this error? I have a ‘/’ in the message as well as some ‘*’ and blank lines and spaces. Could any of these cause this? The AnnouceMaintenance.dll will not install on labtech 10.5 latest version. We have it running in 10.5, Try right clicking DLL and select properties, click “unlock” button then retry to install it. We fixed this in the latest version where we now strip out any CRLF in the body of announcements. Basically having a line break in message breaks the message. I tried a couple of different plugins and unblocked them as you suggested but same error persists. Thanks for the update. I did what you said and removed all of the CRLF’s and it works fine. It just makes it harder to read from the client perspective. If there were a way to put in a line of spaces, dashes or underscores that would accomplish the same thing but I guess I would need to experiment with how many characters per line you are using. Do you have a fixed number of characters per line? How does this work if you have multiple patch schedules? Great concept — problem is all the scripts that get queued up. For 2500 endpoints, this causes issues. It would be nice if the script wouldn’t run at all on days it didn’t need to. I had similar problem with Patch Remedy and LT Support told me to remove it. Also, never saw version 1.0.0.2 or .3. Getting a Unterminated string constant from c:\windows\LTSvc\announcemaintenance.vbs line 1 char 80. Any tips on how to fix? I am having 800A0409 errors as well WHat should it look like? This is a reminder that your computer needs to be LEFT ON tonight so it can complete its required maintenance tonight. You do not need to stay logged in, just log off or reboot when you are done today.